Let’s get the obvious out of the way: supporting Medicaid expansion in Ohio is a political no-brainer. According to one recent poll, 77% of Ohioans support the expansion. From a political perspective, this is not exactly a profile in courage. There is, of course, a more principled reason why we might applaud DeWine for settling, at least for now, even if it is a reversal of his position of only weeks ago, on supporting Medicaid expansion. It remains, as Governor Kasich called it when he pushed through the expansion in 2013, a “matter of life and death.” Almost 700,000 Ohioans now depend on the Medicaid expansion for their access to health care services. As the scholarly literature has long told us about Medicaid, we can assume that this coverage not only improves Ohioans’ health, but helps them to avoid debt caused by medical bills, which means that more Ohioans will be able to pay their rent, keep their lights on, afford food, and meet other basic necessities. Medicaid is quite literally a safety net. DeWine is referring to proposed work requirements as a condition of Medicaid eligibility. But virtually all health policy scholars who have studied the question agree that though such requirements will have little effect in forcing more Medicaid eligibles to work. As Wendy Patton, senior project director at Policy Matters Ohio, has noted, “Work requirements are redundant and unnecessary because most people are working. The problem is there aren’t enough well-paying jobs.” Instead, such requirements will merely serve as a bureaucratic barrier to enrollment, denying many–perhaps up to 18,000–Ohioans who rely on Medicaid for their health care needs–and who may actually be eligible for the program, even those who are currently employed–the ability to receive necessary services. And you thought Republicans hated bureaucracy and red tape. There are legal problems with this proposal as well. A federal district judge recently rejected similar requirements proposed by Ohio’s neighbor, Kentucky, on the basis of that state’s governor’s having not taken into consideration the effect work requirements would have on access. Among other things, the judge called the proposed requirements “arbitrary and capricious.” You can’t just implement a work requirement without at least showing an interest in how many people such a plan will injure. If all of DeWine’s waffling and pandering on the issue isn’t enough for you, there’s a perhaps clearer way to envision what is likely to happen to Medicaid if DeWine is elected. As Plunderbund noted in a recent Tweet, there is a more pragmatic reason to not be too giddy about DeWine’s announcement. Recently, Governor Kasich displayed his support for full Medicaid expansion by vetoing an attempt by the Republican-led legislature to freeze enrollment. 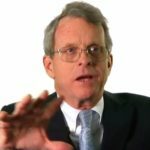 Considering that candidate DeWine’s support for Medicaid expansion is mainly rooted in political opportunism, and only if it “will not exist as we know it,” what do we predict a Governor DeWine would do in the face of an attempt by his own party to roll back health care for 2/3 of a million Ohioans? Does anybody really believe he would take on his own party when his own support for Medicaid is so tentative? Who Is Rescuing Migrant Kids, Too? Meet The New Copperheads. They’re Also Called Republicans.